This beach ranks #20 of the "Best beaches in the World"
There are a lot of cheap hotels and hostels near the beach. In fact these are very basic bungalows, that even gives a certain charm to this place. Fly to Cartagena International Airport (CTG). 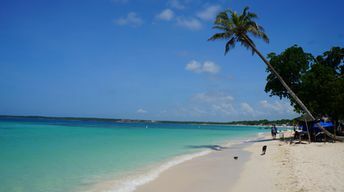 There are two main options to get from Cartagena to Playa Blanca. The first is by boat, the second is by bus + mototaxi. Both options cost about the same ($20 for the round-trip), but bus journey is more tedious and takes longer time. The weather is comfortable in Cartagena all year round. It is hotter and more rain in the summer half of the year. But during the winter half of the year winds are stronger. Each period is good.